“Twilight” does not make you Goth. Goth is a lifestyle. I take issue with poseurs. The de-Gothening is complete. There are no more rooms in my house left to makeover to the mundane. 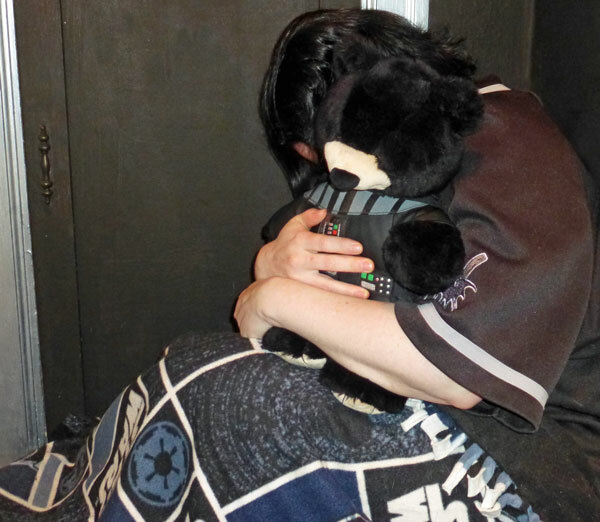 We’re planning a house-mourning party to bid the Gothdom farewell. Warning – this post is very long and picture heavy. No, really. “Six” in French is spelled exactly the same as it is in English, only it’s pronounced “sees.” So this is part six. Click their names to see parts Un, Deux, Trois, Quatre, and Cinq. You can also click on the “adventures in remodeling” tag to see the collection of horrors on the same page. Also why I label these posts in French. Parts Un, Deux, Trois, and Quatre. We Wish You A Merry Sithmas! All right! The Sithmas tree is up, the outside lights are nearly complete, decoration inside is almost finished…it’s very Sithmas-y in the James household! Step One: Put on Tim Burton’s The Nightmare Before Christmas. 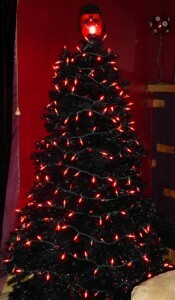 Assemble artificial black tree. String red lights around tree. The Sithmas Tree, up and lit, but not yet decorated. 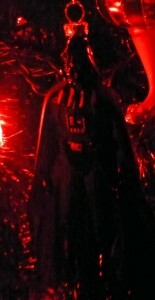 Top with Lord Vader nightlight (lit with red Sithmas bulb). Decorate the Sithmas tree with your ornaments. Give Lord Vader a lightsaber if you have one (if you’re putting up a Sithmas tree, you should have a lightsaber). Sing along with “Making Christmas” from the DVD as you decorate. 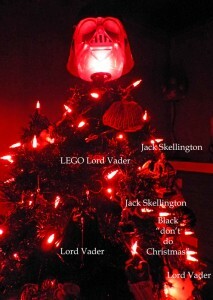 Every Sithmas tree needs a Lord Vader ornament or three. 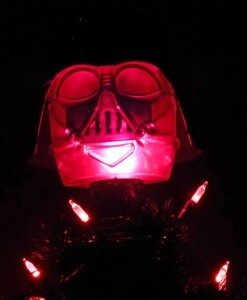 Enjoy the beautiful red glow of your Sithmas Tree! So there you have it! Sithmas cards will be going out by the end of the week. I have my Sithmas countdown calendars up and counting down. The Sithmas countdown calendar in my office. In Santa’s bag there are little ornaments to stick on each day as they’re counted down. Now I just need to finish shopping, knitting, wrapping, parceling, posting….